As a substage of the Middle Stone Age preserving evidence for a range of innovative behaviors, the Still Bay plays a key role in discussions about behavioral evolution during the Late Pleistocene. And yet, the number of sites containing well-preserved SB faunal assemblages remains small—fewer still also preserve pre-SB deposits. This paper presents data on the macromammal remains excavated from the pre-SB (~ 77–73 ka) and SB (~ 71 ka) deposits at the Sibudu Cave (KwaZulu-Natal, South Africa) under the direction of Lyn Wadley. The assemblage is heavily fragmented and highly burned. While humans appear to be a primary contributor to the assemblage, non-human predators played a role in the collection of small ungulates and miscellaneous small game; that role was particularly marked in the upper portion of the pre-SB sequence. A strong focus on suids and evidence for human collection of a diverse assemblage of small game in the lower deposits from the pre-SB—and a high frequency of blue duiker (Philantomba monticola) in the SB—suggests that the use of remote capture technology may date to ~ 77 ka. I consider the implications of these and other trends in the data, including a lack of evidence for major changes in the environment spanning from 77 to 71 ka. Testing hypotheses about the onset (and disappearance) of the SB requires data on variation along multiple dimensions of human behavior and in the natural environment; this study contributes to these ends by presenting taphonomic and taxonomic data on the pre-SB and SB fauna at Sibudu. The online version of this article ( https://doi.org/10.1007/s41982-019-0021-6) contains supplementary material, which is available to authorized users. Over the last 15 years, we have witnessed a veritable sea change in research on human behavioral evolution during the Later Pleistocene. Scholars have increasingly moved away from the “behavioral modernity” debate, focusing instead on characterizing the nature and extent of variability in human behavior within the Middle Stone Age (MSA) and Middle Paleolithic (MP)—and on uncovering the impetus behind the emergence (and disappearance) of innovative behaviors during this period (e.g., Kandel et al. 2016; Kuhn and Hovers 2006 and papers therein; Langley et al. 2008; Mackay et al. 2014; Roberts and Stewart 2018; Shea 2011). Detailed analyses of variation within the MSA and MP serve a number of critical ends: not only will they enable us to test models regarding the development of a fully modern cultural system, but they will also help establish “how and when crucial cultural innovations became established in human history” (per d'Errico et al. 2012: 2480). They are also directly relevant to broader research aimed at understanding similarities (and differences) in the adaptive capabilities and strategies of our species relative to archaic populations such as the Neanderthals. Within this milieu, a significant amount of attention has focused on the southern African record, where two industries are associated with evidence for a suite of innovative behaviors—the Still Bay (SB) and the Howieson’s Poort (HP). While the dating of these industries—and the duration of the temporal gap between them—remain topics of controversy (e.g., Guerin et al. 2013; Jacobs and Roberts 2017; Jacobs et al. 2008a, 2013; Tribolo et al. 2013), widely accepted date ranges are ~ 75–71 ka for the SB and ~ 65–59 ka for the HP (Henshilwood 2012). Innovative technological behaviors include the use of heat treatment and pressure flaking (Brown et al. 2009; Mourre et al. 2010; Schmidt and Högberg 2018) to produce some of the bifacial, leaf-shaped points that define the SB. The HP is associated with backed tools (some of which are microlithic in dimensions) and bone points, some of which served to tip arrows (Backwell et al. 2008, 2018; Lombard and Phillipson 2010; Wadley and Mohapi 2008). Innovative cultural behaviors include the production of shell beads, engraved ochre, and abstract ochre drawings in the SB (d'Errico et al. 2005, 2008; Henshilwood et al. 2002, 2018) and engraved ostrich eggshell in the HP (Texier et al. 2010; Henshilwood et al. 2014). As the earlier of the two, the SB has received particular attention. In fact, it has been proposed that the SB represents “the first known cultural adaptation in which technological and symbolic innovations of a complexity comparable to the innovations seen in modern hunter-gatherers appear as a coherent and recognizable package” (d’Errico et al. 2017: 7870). The onset of the phase is closely correlated with that of Marine Isotope Stage (MIS) 4. As such, it is perhaps not surprising that a number of scholars have proposed that the SB arose as a response to environmental change and/or increased climatic instability (e.g., Bar-Matthews et al. 2010; McCall and Thomas 2012; Ziegler et al. 2013). And yet, Jacobs et al. (2008a) could not identify any particular climatic attribute that was consistently or uniquely associated with the SB; because SB sites also cross-cut several ecological zones, they argued against environmental change as a primary catalyst for the SB. Using multi-proxy, high-resolution records from Blombos and Klipdrift Caves, Roberts et al. (2016) also argued against climate as a prime driver of the cultural and technological innovations seen in the SB. As Carr et al. (2016:39) aptly point out, “linking specific aspects of human development such as stone tool industries or technocomplexes to environmental change is fundamentally difficult and contentious.” Not only do some of these models rely on global (vs. local) climate data, but they also often fail to adequately address the mechanisms by which climate change promotes behavioral change. Carr et al. (2016): Fig. 2.8) highlight the complex web of interactions that exist between climate, geology, resource availability, and human behavior—fully evaluating the role environmental change may have played in the appearance of the SB will require a consideration of all of these variables. As research into the SB has progressed, it has become increasingly clear that it should not be treated as a homogenous entity. Although sites preserving multiple occupational horizons associated with the SB are rare, work at Blombos Cave has documented diachronic variation in both the lithic and faunal assemblages (Archer et al. 2015; Discamps and Henshilwood 2015; Thompson and Henshilwood 2011). Analysis of the lithics from Diepkloof also found evidence for evolution in lithic production strategies over the course of the SB (Porraz et al. 2013). A number of scholars have explored variation in the expression of the SB across the southern African subregion (e.g., Archer et al. 2016; Högberg and Lombard 2016; Lombard and Högberg 2018; Mackay et al. 2014; Soriano et al. 2015). Of particular note are studies by Archer et al. (2016) and Soriano et al. (2015), which document some marked differences in the bifacial technology associated with SB sites in the Cape (including Blombos and Diepkloof) as compared to those in the northeastern portion of the region (including Sibudu and Umhlatuzana). While neither proposes removing the “Still Bay” label from sites in the northeast, they do suggest that all of the sites that have been assigned to the SB may not represent the same cultural unit. The analyses of geographic variation in the expression of the SB have primarily focused on lithic data; we need a better understanding of variation in other dimensions of human behavior, including subsistence strategies, landscape use, the production/use of shell beads, and ochre use. Understanding the broader significance of the SB also requires a deeper understanding of how it is similar to—and different than—the period immediately preceding it. Some scholars have been critical of the intense focus on the SB and the HP, pointing out that it is equally important to study the periods pre- and post-dating them, which are often referred to in the literature as the “pre-SB” and the “post-HP” (Conard et al. 2012). Following Lombard et al. (2012), the pre-SB is defined here as spanning from 96 to 72 ka; note that the end date is considered variable and depends on when the SB appears at a given site. The technology of the pre-SB has not yet been well characterized (Lombard et al. 2012; but see Rots et al. 2017); however, certain innovative technological behaviors associated with the SB do appear to pre-date the phase, including the heat treatment of chert (Brown et al. 2009), pressure flaking (Rots et al. 2017), and the production of bone tools (d'Errico et al. 2012). 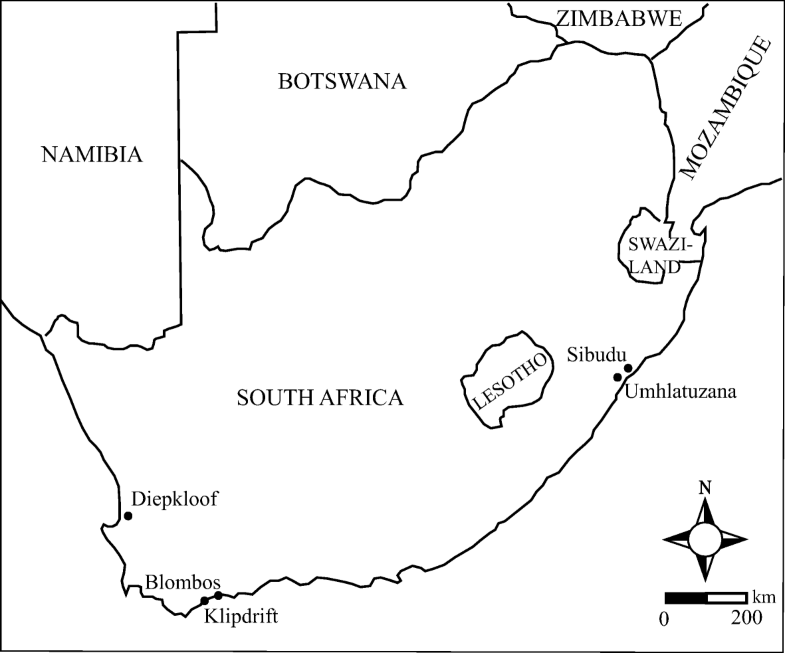 At present, it is difficult to evaluate how subsistence behavior may have varied between the SB and the pre-SB; among the few sites that preserve deposits from both stages, detailed taphonomic and taxonomic analyses are only available for Blombos Cave, and the pre-SB assemblage from Blombos (layer M2, dating to ~ 85 ka) is dominated by small ungulates that appear to have primarily been introduced by carnivore activity (Reynard and Henshilwood 2017; Thompson and Henshilwood 2011). With pre-SB deposits spanning from ~ 77 to 73 ka, and a SB industry dating to ~ 71 ka, Sibudu offers a unique opportunity to grapple with these issues. This paper presents taphonomic and taxonomic data deriving from analysis of the complete sample of macromammal remains excavated from the pre-SB and SB deposits under the direction of Lyn Wadley. My primary goal is to characterize the nature and extent of variation in the faunal remains, both within the pre-SB and between the pre-SB and SB. Following a summary of relevant research at Sibudu, I present the results of the faunal analysis, beginning with a consideration of taphonomic variables. Taphonomic analysis focused on assessing the nature/extent of fragmentation, the degree of post-depositional disturbance, and potential agents of accumulation. After addressing these issues, I evaluate what the faunal remains suggest about environmental conditions during the pre-SB and SB occupations of Sibudu. I will also consider the ungulate and non-ungulate faunal remains in greater detail, particularly as relates to potential variation in subsistence strategies over time. I close with a discussion of the implications of these results to our broader understanding of the pre-SB and SB at Sibudu. Sibudu is located ~ 40 km north of Durban and 15 km inland from the Indian Ocean (Fig. 1). Although referred to as Sibudu Cave, the site is technically a rock shelter. The shelter was cut into a sandstone and shale cliff via fluvial erosion; downcutting has continued since its formation, such that the shelter is currently situated ~ 20 m above the uThongathi River (Wadley and Jacobs 2004; Allott 2005). The most straightforward means of accessing the site requires crossing the river and scaling a 3-m-high rock face; however, because the process of downcutting is ongoing, the vertical distance to be traversed may have been somewhat reduced during the Middle Stone Age. To date, excavations have focused on the northern portion of the shelter; the main excavation unit is at 100 m above sea level (asl; Fig. 2). The shelter is long but shallow (roughly 55 m wide and 18 m in depth) and slopes downward from north to south (Wadley and Jacobs 2006). The site was first excavated by Aron Mazel, who dug a trial trench at the site in 1983. Between 1998 and 2011, Lyn Wadley (University of the Witwatersrand) directed excavations at Sibudu. 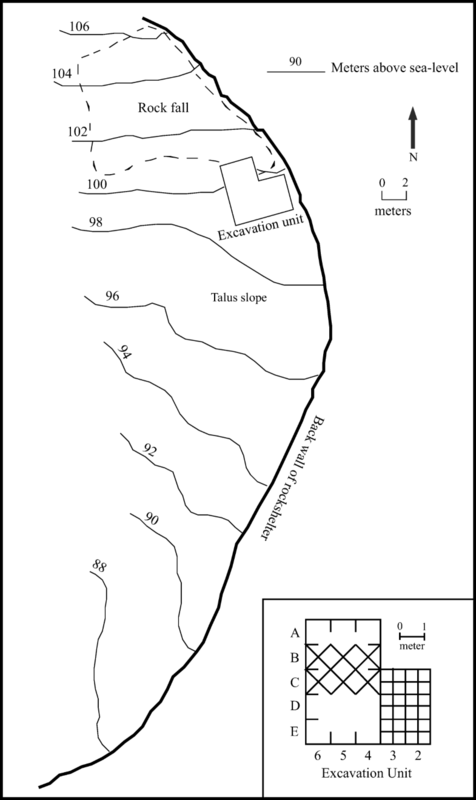 Her team uncovered a long MSA sequence, with occupations corresponding to the pre-Still Bay (~ 77 ka), Still Bay (~ 71 ka), Howieson’s Poort (~ 65–62 ka), post-Howieson’s Poort MSA (~ 57 ka), late MSA (~ 48 ka), and final MSA (~ 38 ka; Jacobs et al. 2008a, b; Wadley and Jacobs 2006). No Later Stone Age (LSA) deposits have been recovered from the site; instead, the MSA is capped by a series of Iron Age deposits. Wadley’s team excavated a total of 21 sq. m of MSA deposits; however, the lowermost layers at the site (including some of the post-HP MSA, the HP, the SB, and the pre-SB) were recovered from a 6-m2 unit known as the “deep sounding” (Fig. 2). Since 2011, the project has continued under the direction of Nicholas Conard (University of Tübingen). In addition to excavating in the deep sounding, Conard’s team has focused on another 6 sq. m unit referred to as the “Eastern excavation”; the uppermost layers excavated in this unit derive from the post-HP MSA, which Conard’s team has renamed the Sibudan (Conard et al. 2012; Will et al. 2014). 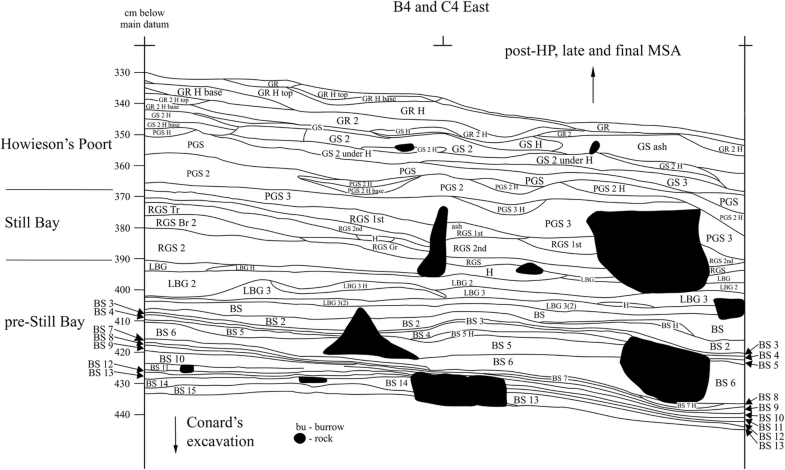 The fauna reported here comes from Wadley’s deep sounding; as such, further discussion of the SB and pre-SB deposits refers only to material excavated as part of that project (see Fig. 3 for a stratigraphic profile drawing). Deposits were excavated in 50 × 50 cm quadrants following natural stratigraphy; if layers exceeded five centimeters in depth, they were divided into artificial spits (i.e., RGS, RGS2). All sediments were sieved through nested 2 mm and 1 mm screens. The pre-SB layers excavated by Wadley comprise two distinct members: Brown Sand (BS) and Light Brownish Gray (LBG; Table 1). The oldest layers, referred to as the Brown Sand (BS) member, have been OSL dated to 77.2 ± 2.6 ka (Jacobs et al. 2008a). This member consists of a series of thin layers referred to as BS1-BS15 (Munsell color 7.5YR 4/3 Brown). No major color changes were identified within the BS member; instead, the layers were separated by what Wadley refers to as distinct “activity floors” which comprise features such as hearths, ashy patches, plant bedding, and stone tool horizons that give the appearance of pavements (Wadley 2012). Overlying the BS member is the LBG member; two dates have been obtained for this member—73.2 ± 2.7 ka from LBG2 and 72.5 ± 2.5 ka from LBG. These layers were named for the color of the deposits (Munsell color 10YR 6/2 Light Brownish Gray) and contained extensive roof fall which appears to pre-date the deposition of these layers (Jacobs et al. 2008a; Wadley 2012). The SB at Sibudu is represented by the Reddish Gray Sand (RGS) layers; these are comprised of loose, reddish gray sand (Munsell color 5YR 5/2 Reddish Gray, Wadley 2012). An OSL age of 70.5 ± 2.4 ka was obtained from layer RGS (Jacobs et al. 2008a); given the overlap in the range of error for the dates from LBG and RGS, it is possible that Sibudu captures the transition from the pre-SB to the SB relatively closely. Furthermore, while no sterile layer was identified between the upper-most SB deposits (RGS) and the lower-most Howieson’s Poort (layer Pinkish Gray Sand, or PGS), the OSL ages suggest that an occupational hiatus of as many as 5000 years separates the two industries (PGS was assigned an age of 64.7 ± 1.9 ka; Jacobs et al. 2008a). It has been proposed that rock fall events may have led to minor disturbance/mixing between RGS and PGS (de la Peña and Wadley 2014b); Soriano et al. (2015) argue that the presence of HP-like backed tools in RGS and SB-like bifacial pieces in PGS lends support to this hypothesis. Geoarchaeological work published to date has largely focused on the upper portions of the sequence (spanning from the HP to the final MSA); results indicate that these deposits are predominantly anthropogenic in origin (Goldberg et al. 2009; Schiegl and Conard 2006). Wadley et al. (2011) report on evidence for the construction of plant-based “bedding” throughout the MSA at Sibudu; the behavior dates back to at least 77 ka. Their analysis incorporated sediment micromorphology samples from BS and LBG, both of which preserve “centimeter-thick compacted layers of finely laminated, herbaceous material, including stems and leaves, that are capped by laminated, articulated phytoliths” (Wadley et al. 2011: 1389). The bedding from BS is unique in the sequence for being unburned; all bedding from LBG and above is burned. While the nature of the bedding deposits suggests that they underwent extensive trampling, it is argued that chemical diagenesis is moderate and the context of this material is “pristine” (Wadley et al. 2011: SOM). This suggests that the pre-SB has good stratigraphic integrity. Unfortunately, the results of micromorphological analysis of the SB deposits (RGS) are not yet available. Analysis of the artifacts and ecofacts recovered from the pre-SB and SB deposits at Sibudu is ongoing; here, I will summarize the most relevant results to date, beginning with the lithics. The stone tools associated with the BS and LBG members have been informally classified as the “pre-SB” (Wadley 2012). Although a detailed study of these lithics remains to be published, Wadley (2012) discusses some preliminary results. The lowermost BS layers (BS15-BS 11) include thin, bifacial points, while the upper layers (BS10-BS) show few formal tools other than a small quantity of unifacial points and some denticulates. Retouched pieces are also rare in the LBG layers. The SB lithics have been the subject of significantly more research (Archer et al. 2016; Lombard 2006; Soriano et al. 2009, 2015; Wadley 2007; Wojcieszak and Wadley 2018). As discussed above, although the RGS layers at Sibudu include bifacial, lanceolate points—the type fossil for the SB Industry—comparative work by Archer et al. (2016) and Soriano et al. (2015) suggests that the bifacial technology evidenced at Sibudu is sufficiently distinctive from that associated with SB sites in the Cape region that they may not be from the same cultural unit. That being said, the SB lithic assemblage is dominated by shaping by-products, with bifacially-shaped implements (mostly foliate points) being the primary objective of lithic production (Soriano et al. 2015). Few cores are present in the assemblage, and shaping flakes identified as coming from the initial stages of manufacture are rare (< 10% of the assemblage). Soriano et al. (2015) propose that the bifacial points at Sibudu were maintained for long-term use; detailed analysis of even the smallest bifacial fragments suggests that points were subjected to intensive re-sharpening and reworking. Soriano et al. proposed that the bifacial points were utilized to tip hunting weapons and as cutting tools; this is consistent with the results of residue analysis (Lombard 2006). As regards other analyses, Hodgskiss (2013) reports on the full sample of ochre from the Wadley excavations; she combined BS and LBG into in single “pre-SB” unit for most of her analyses. Not only does the pre-SB preserve the highest frequency of utilized ochre in the entire sequence (21.5%), but scored pieces are also more common in those layers (although these pieces are rare, overall). In comparison, 15.3% of the ochre pieces recovered from the SB show evidence for use wear. Organic artifacts are also present in the pre-SB and SB at Sibudu; d'Errico et al. (2008) discuss the analysis of five Afrolittorina africana shells from the SB, three of which are perforated and may represent shell beads. Worked bone has also been reported from the pre-SB (d'Errico et al. 2012; Wadley 2012); however, the full assemblage of modified bone has yet to be analyzed—many potentially worked pieces were discovered in the process of sorting the fauna for the current study. A deciduous human molar (lower left dm1) was recovered from layer BS5; its dimensions are comparable in size to other MSA specimens (Riga et al. 2018). Some faunal data for the pre-SB and SB are available; Val and colleagues analyzed the avian remains (Val 2016; Val et al. 2016), while Plug (2006) presents preliminary data on aquatic species represented in the assemblage. In her analysis of the full avifaunal sample from Sibudu, Val (2016) found that the pre-SB layers yielded the largest number of bird bones and the most diverse assemblage (NISP: 962, 33 species represented); like Hodgskiss (2013), she treated the pre-SB as a single analytical unit. The SB was also relatively rich in terms of the quantity of bird bones and the number of species (NISP: 271, 21 species represented). Several lines of evidence suggest that birds of prey—likely peregrine and/or lanner falcon (Falco peregrinus and Falco biarmicus, respectively)—made a significant contribution to the accumulation of the avian remains, particularly in the pre-SB (Val 2016). However, the presence of anthropogenic modifications, including cut marks, suggests that at least some of the birds were collected by humans (Val et al. 2016). Three percent of the pre-SB and 3.7% of the SB assemblage preserves cut marks, the majority of which occur on wing and thoracic girdle elements. The most notable aspect of Plug’s (2006) preliminary analysis of the aquatic species relates to the fact that the SB includes the largest sample of marine shell in the sequence, with eight types identified. The most commonly identified species is the brown mussel (Perna perna), although the minimum number of individuals (MNI) for that species was only 15. However, Plug (2006) reports that many of the marine shell fragments appear to be beach worn, suggesting that they do not primarily represent food waste, but were collected for other reasons. Finally, given that macromammals can serve as a somewhat coarse indicator of climate—and because they may not be taken in direct proportion with their availability in the environment—it is relevant to consider other data which speak to paleoenvironmental conditions during the pre-SB and SB. Looking first to the macrobotanical record, a recent analysis of the charcoal assemblage incorporates samples from BS and RGS (Lennox and Wadley 2019; charcoal is present in LBG, but it was not included in that study). In comparing the number of evergreen vs. deciduous genera represented in the sample, Lennox and Wadley found that evergreen taxa dominate the assemblage in both the pre-SB and SB, accounting for > 70% of genera in BS and > 60% in RGS; deciduous taxa present include those that occur primarily on forest fringes. Taxa representing savannah and cliff-scrub vegetation were also identified, suggesting that a mosaic of habitat types was present in the vicinity of the site. Analysis of fauna and flora from the later deposits at the site indicate that this type of mosaic persisted throughout the MSA occupation of the site (Allott 2005, 2006; Bruch et al. 2012; Clark 2011, 2013, 2017; Clark and Plug 2008; Glenny 2006; Hall et al. 2008, 2014; Plug 2004; Sievers 2006; Wells 2006). Although the natural vegetation around the site has been impacted by decades of sugar cane farming, even today, the cool/moist conditions created by shade from the cliff promote forest growth around the shelter, while the sunny slopes opposite the shelter support more open vegetation (Wadley 2006). Seeds have also been recovered at Sibudu; sedge seeds have been identified in both the pre-SB and SB deposits, suggesting that a water source (likely the uThongathi River) was present near the shelter during its occupation (Sievers 2006; Sievers and Muasya 2011; Wadley et al. 2011). Two other sources speak to environmental conditions during the pre-SB and SB. In her analysis of the avian remains, Val (2016) identified several forest-dwelling birds in the pre-SB, including African olive pigeon (Columba arquatrix), turacos (Musophagidae, species unknown), trumpeter hornbill (Bycanistes bucinator), cape parrot (Poicephalus robustus), and buff-spotted flufftail (Sarothrurua elegans). Birds from open grassland settings are extraordinarily rare. According to Val (2016), the bird remains do not indicate any major changes in the extent of forest spanning from the pre-SB to the SB. Carbon and oxygen isotope data deriving from a sample of mammalian tooth enamel also suggest that closed habitats (likely forest) made up an important component of the local environment in both the pre-SB and SB (Robinson and Wadley 2018). However, Robinson and Wadley propose that shifts in the oxygen isotope values for African buffalo (Syncerus caffer) and bushpig (Potamochoerus larvatus)—two of the most common species in the analysis—may indicate some contraction in closed habitats in the SB. Taken as a whole, the available data are consistent in indicating closed conditions during both the pre-SB and SB, although both the charcoal and isotopic data hint that there may have been a slight reduction in forest cover during the SB. However, it is relevant to reiterate that the charcoal analysis did not include any samples from LBG (Lennox and Wadley 2019), and Val (2016) and Robinson and Wadley (2018) both combined BS and LBG into a single analytical unit. In this study, the faunas from BS and LBG are treated separately, providing a greater degree of resolution when considering possible shifts in the local environment spanning from 77 to 71 ka at Sibudu. This study incorporates the total sample of macromammal remains excavated from the pre-SB and SB deposits at Sibudu under the direction of Lyn Wadley; this includes the SB fauna preliminarily analyzed by Ina Plug (referenced in Wadley 2007). 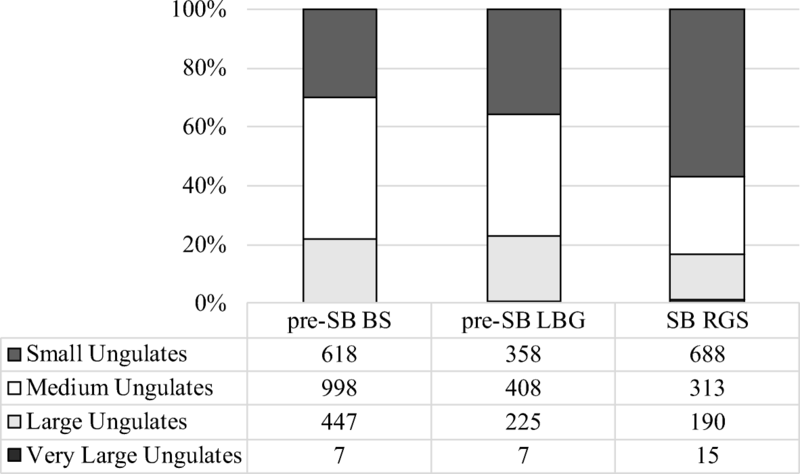 Data for the two pre-SB members (BS and LBG) are treated separately. Macromammals are defined as species with an average mass in excess of 300 g; as a point of reference, the smallest species included in this analysis is the Gambian giant rat (Cricetomys gambianus; avg. mass 1–1.5 kg). For purposes of consistency and in order to facilitate comparison across archeological horizons, methods of analysis generally follow those utilized for the HP and post-HP MSA fauna at the site (see Clark 2009, 2011, 2017; Clark and Plug 2008). The initial stages of processing were undertaken either by or under the direct supervision of the author; all subsequent analyses (including taxonomic identification and taphonomic study) were completed by the author. Data collection took place at the University of the Witwatersrand (Johannesburg) and the Ditsong National Museum of Natural History (Pretoria) between 2013 and 2015. Once potentially identifiable remains had been pulled for additional study, the non-identified remains were sorted by size. Material greater than 2 cm was sorted into categories (e.g., long bone shaft, skull, enamel, rib, vertebrae, and miscellaneous) and then counted and weighed, while material less than 2 cm was simply weighed. In order to be considered identifiable, a specimen had to be identifiable to taxon—minimally to class and a size category within that class, such as “medium mammal”—and to skeletal element. This means that long bone shaft fragments were included only if they retained sufficient morphology to be identifiable to element. Although long bone shaft fragments can potentially be identified to element using cross-sectional geometry, experimental studies by Pickering et al. (2006) and Merritt and Davis (2017) demonstrate that this method is not reliable when specimens preserve less than 50% of the shaft circumference. A vast majority of limb shaft fragments from Sibudu preserve less than this amount, precluding the use of this method. Instead, identification relied on diagnostic features such a foramina and muscle attachments. Furthermore, while some have demonstrated that shaft fragments can be identified to size class using cortical thickness (e.g., Reynard et al. 2014), the non-identifiable shaft fragments at Sibudu are often splintered in such a way that the full cortical thickness is not preserved. Reynard et al. (2014) also suggest that this method is best applied in assemblages with low species diversity, which is not the case at Sibudu. Specimens were identified using the comparative collection housed in the Archaeozoology and Large Mammal section of the Ditsong National Museum of Natural History. Bovids are the most common taxa at the site; when remains could not be identified to the species-level, they were assigned to size class using a modified version of Brain’s (1974) classification system (Table 2). For analytical purposes, the broader ungulate assemblage is occasionally combined into size classes; these are defined as follows: small ungulates are made up of the Bov I specimens, medium ungulates comprise the Bov II remains, as well as suids, large ungulates include the Bov III and IV remains, as well as equids, and very large ungulates include the Bov V specimens, hippopotamus, giraffe, elephant, and rhinoceros. Consistent with previous analyses at Sibudu (Clark 2017), I also utilize a “miscellaneous small mammal” category, which comprises non-ungulate fauna with an average mass of less than 25 kg. All identifiable faunal specimens were weighed and measured, and age at death was estimated based on epiphyseal fusion and tooth eruption/wear; among the unfused specimens, fetal/neonate remains were identified based on surface texture/morphology. Bones were categorized as non- or lightly burned (NB/LB, < 50% carbonized), moderately burned (MB, > 50% carbonized), or highly burned (HB, > 50% calcined). The joint NB/LB category exists because it is not always possible to distinguish color changes caused by heat damage from mineral or bacterial staining; this is especially the case for small fragments (see Clark and Ligouis 2010 for more details). The most conservative treatment of these data is to consider the NB/LB category as essentially unburned. Identified bones were examined under a binocular microscope at × 8–40 magnification in order to assess the degree of cortical preservation and to identify surface modifications. Cortical preservation was coded as good (surface well preserved), fair (surface shows light cracking or peeling and/or is partially obscured), or poor (little to no preservation of the original bone surface and/or more than 75% of the surface is obscured). Data were also collected on the presence and orientation of cut/chop marks, percussion damage, carnivore activity (tooth punctures, scores, or gnaw marks), rodent gnawing, gastric etching, insect damage, and raptor damage, following the diagnostic criteria of Andrews (1990), Backwell et al. (2012), Binford (1981), Blumenschine and Selvaggio (1991), Blumenschine et al. (1996), Dominguez-Rodrigo et al. (2009); Lyman (1994), Milo (1994), and Pickering and Egeland (2006). The presence of chemical weathering and root damage was also noted. Only unambiguous marks were recorded. Recent work has demonstrated the utility of systematically recording trampling damage—and has defined diagnostic criteria for identifying this damage (e.g., Dominguez-Rodrigo et al. 2009; Fernandez-Jalvo and Andrews 2016; Reynard and Henshilwood 2018). However, at the time these data were collected, not all of these papers had been published. Furthermore, I did not have access to an appropriate reference sample to assist in the accurate identification of this damage. As such, the frequency of trampling damage is no doubt underestimated. Taxonomic data are presented in terms of both NISP (number of identified specimens) and MNI (minimum number of individuals). When calculating MNI, both symmetry and age were taken into account. MNI counts were calculated using the most common portion of the most common skeletal element (Stiner 2005). Because portion codes were designed to be as discrete as possible, MNE (minimum number of element) counts were based on the most common portion of a given element; MNE values were then used to calculate the MNI for each taxa (see Clark 2009 for more details). Specimens identified to higher-level taxonomic categories (e.g., Bov III, large rodent) were only assigned an MNI count if they must have come from individuals beyond that identified in the applicable lower-level categories. The only exception relates to the calculation of MNI counts for the Bov I remains. With an average mass of 4.5 kg, blue duiker is significantly smaller than the next largest Bov I species identified in the assemblage—red duiker (Cephalophus natalensis), which averages 12 kg in mass (Skinner and Chimimba 2005). This meant that blue duiker remains could be identified by size alone; as such, these were excluded when calculating the MNI for the Bov I size class. Although both NISP and MNI values are presented, NISP serves as the basis for a majority of the analyses reported in this paper—see Clark (2017) for a detailed discussion as to why NISP is the preferred unit of analysis for the Sibudu fauna. MNI values are included so that those who prefer to utilize this measure have access to these data. Quantitative analyses primarily rely upon comparisons of frequency data using chi-square (χ2) analysis or Fisher’s Exact test, with significance at the α = 0.05 level. Unless otherwise indicated, statistical tests were conducted using JMP Pro 13. One of the defining characteristics of the Sibudu fauna is that it is highly fragmentary (Cain 2005; Clark 2011, 2017; Clark and Plug 2008; Clark and Ligouis 2010; Collins 2015, 2016; Wells 2006). Because fragmentation can impact analyses of taxonomic abundance and skeletal part data (e.g., Cannon 2013; Klein 1989; Lyman 1994; Merritt and Davis 2017; Yeshurun et al. 2007), it is important to evaluate the degree and nature of fragmentation and its possible impacts on the assemblage—and to explore whether these seem consistent over time. I will utilize data on the distribution of maximum fragment lengths as a more general means of characterizing the degree of fragmentation (Outram 2001). An analysis of fracture patterns on the identified long bone shaft fragments can provide information on the relative timing of bone breakage; i.e., whether bones were primarily broken when fresh/green, presumably reflecting fragmentation that occurred during processing/consumption, or when dry, reflecting primarily post-depositional breakage (e.g., Pickering et al. 2005; Villa and Mahieu 1991). However, experimental work has demonstrated that even when lightly heated, burned bone displays fracture characteristics associated with dry bone breakage (regardless of whether the bone was fresh or dry when exposed to heat; Cáceres et al. 2002). As such, burned bone should be excluded from consideration. As mentioned above, it was not always possible to distinguish color changes associated with light heating from mineral or bacterial staining, resulting in the use of a joint NB/LB category. Given this, fracture pattern data will not be included in this study. Following Clark (2017), the relative extent of post-depositional destruction will be evaluated using a modified version of the “completeness index” developed by Marean (1991). Because experimental studies have indicated that carpals and tarsals (excluding the calcaneus) are unlikely to be fragmented during human processing or carnivore ravaging, Marean (1991) argued that the degree of fragmentation among these bones can provide insight into the extent of post-depositional destruction. As defined by Marean, the index utilizes data on the percentage of the total bone represented by each fragment; because I did not record those data, I follow the modifications of Villa et al. (2004), in which the number of complete and almost complete carpals and tarsals are added together and then divided by the total number of fragments. Specimens identified as belonging to juvenile or fetal/neonate individuals were excluded, as were specimens bearing gastric etching, tooth marks, percussion damage, cut marks, or weathering. Completeness indices will be compared across time within each ungulate size class in order to explore variation in the degree of post-depositional destruction over time. These data will also be utilized to assess whether the bones of large ungulates were more heavily impacted by post-depositional destruction than those from smaller ungulates, as proposed by Yeshurun et al. (2007). Within each archeological horizon, I will apply Cochran’s test for linear trend (also known as the Cochran-Armitage test) to explore differences in the degree of fragmentation across body size groups (see Cannon 2001 for a discussion of the utility of this test; test conducted in Microsoft Excel for Mac 2015 using a macro developed by Michael Cannon, available at http://home.utah.edu/~u0577421/). While interpretation of skeletal part data is notoriously fraught, particularly when assemblages are highly fragmentary, these data can potentially be informative about variation in human transport and processing strategies (e.g., Faith and Gordon 2007; Marean and Frey 1997; Morin et al. 2017a, b; Munro and Bar-Oz 2004 and references therein; Stiner 2002). Before delving into the skeletal part data, it is important to first consider whether these data have been biased by density-mediated attrition (Lam and Pearson 2005; Lam et al. 2003; Lyman 1994). Following earlier analyses at Sibudu (e.g., Clark 2009, 2017), bovid skeletal element representation is compared to bone mineral density (BMD2) values provided by Lam et al. (1999) for blue wildebeest (Connochaetes taurinus); note that because of their lesser density, juvenile and fetal/neonate remains were excluded from analysis. Analyses are based on Kendall’s tau-b, a non-parametric test which can be more sensitive to tied data than Spearman’s rho. When developing the coding scheme, portion codes were aligned to Lam et al.’s (1999) scan sites as closely as possible (see Clark 2009 for a list of portion codes, corresponding scan sites, and density values). The frequency of each scan site is expressed in terms of normalized NISP (nNISP), which takes into account the number of times a given scan site occurs in a complete skeleton. Within each archeological unit, small (Bov I), medium (Bov II), and large (Bov III/IV) bovid remains are treated separately. When considering element frequency data for the ungulate assemblage, the skeleton has been divided into six anatomical units: skull, axial, forelimb, hindlimb, distal limb, and feet (Table 3 presents a list of the elements contained in each unit). Heavy fragmentation precluded the assignment of rib and vertebra fragments to taxa/size class (with the exception of the axis and atlas); as such, axial elements are not incorporated into analyses of skeletal element profiles. These profiles are created by normalizing the raw data based on the number of bones in each anatomical unit in a single skeleton—because cranial and mandibular elements identified in the sample are all bilateral, they are treated in the same way as other paired elements. In other words, instead of dividing the number of skull elements by three (cranium, mandible, and hyoid), that number is divided by five (accounting for left/right elements of the cranium and mandible). Bovids and suids are treated independently because the number of bones differs between the two taxa. This method is consistent with that used in earlier analyses at Sibudu (Clark 2009, 2011, 2017; Clark and Plug 2008); skeletal part data are treated in a similar way by Reynard and colleagues in their analysis of the HP fauna from Klipdrift and the SB fauna from Blombos (Reynard and Henshilwood 2017; Reynard et al. 2016). Skeletal element profiles will be presented across time for each size class. A complete species list is presented in Table 4, while Table 5 presents summary data on the pre-SB and SB fauna from Sibudu. The total NISP for the assemblage is 4916, of which 2376 derive from BS, 1157 from LBG and 1383 from RGS. The fauna is highly fragmentary; although the non-identifiable fragments < 2 cm were not counted, those remains make up the majority of the bone weight in each unit under consideration. The degree of fragmentation is illustrated by the fact that roughly 8% of the assemblage (by weight) is identifiable. A review of the literature indicates that MSA faunal analysts rarely report on the full count/weight of the non-identifiable fraction of an assemblage. However, looking further afield, the relative percentage of identifiable bone in the pre-SB and SB at Sibudu is broadly comparable to that from a number of Late Pleistocene assemblages from the Mediterranean and Western Europe—particularly those that show high degrees of burning (e.g., Morin 2012; Starkovich et al. 2018; Villa et al. 2004). The sheer abundance of fauna in the pre-SB and SB is illustrated by the fact that more than 98 kg of bone was recovered from ~ 1.4 cubic meters of deposit. The HP fauna from Sibudu was notable for its high density of faunal remains (more than 60 kg of bone/cubic meter; Clark 2017), and yet, all three units under consideration show a higher density of bone than that found in the HP. The density of bone increases with depth; however, in the absence of comparable data on lithic densities or geoarchaeological data on diagenesis and sediment accumulation rates, it is difficult to evaluate the broader implications of this pattern. Just as small fragments comprise the bulk of the non-identified sample, so, too, do they dominate among the identified remains. Specimens less than 2 cm in maximum dimension account for between 62 and 65% of the NISP (Fig. 4; see Table S1 in the Electronic Supplementary Material for the raw data). The distribution of fragment lengths is not significantly different across the three units under consideration (χ2 = 8.603, p = 0.3769). While this could be taken to mean that the degree of fragmentation is relatively consistent over time, when assessing this type of variation, one must take into consideration potential changes in the representation of large vs. small animals—all else being equal, one would expect an assemblage dominated by large animals to be comprised of larger fragments than one dominated by small animals (see Cannon 2013 and references therein). As indicated in Fig. 5, there is marked variation in the ungulate size class data, and these differences are significant both within the pre-SB and between the pre-SB and SB (total assemblage: χ2 = 272.354, p < 0.0001; BS vs. LBG: χ2 = 17.783, p = 0.0005; LBG vs. RGS: χ2 = 103.784, p < 0.0001). Given that the relative frequency of small ungulates increases over time—accounting for nearly 60% of the assemblage in the SB—one might expect to see a parallel decrease in fragment size spanning from BS to RGS. The fact that the BS and LBG have a higher frequency of medium/large ungulates but a similar distribution of fragment sizes therefore implies that the pre-SB assemblages have suffered a greater degree of fragmentation than the SB fauna. Given the body of experimental work demonstrating that heat damage can promote fragmentation—both pre- and post-depositionally (e.g., Costamagno et al. 1998, 2005; Stiner et al. 1995)—the high degree of fragmentation at Sibudu has often been linked to burning (e.g., Cain 2005; Clark 2017; Clark and Ligouis 2010; Collins 2015). It is thus relevant to consider the data on the frequency of burned bone in the pre-SB and SB (Fig. 6). Bones showing color changes associated with heat damage decline over time; 39% of the assemblage from BS was coded as moderately or highly burned, versus 35.7% from LBG and 25.1% from RGS. 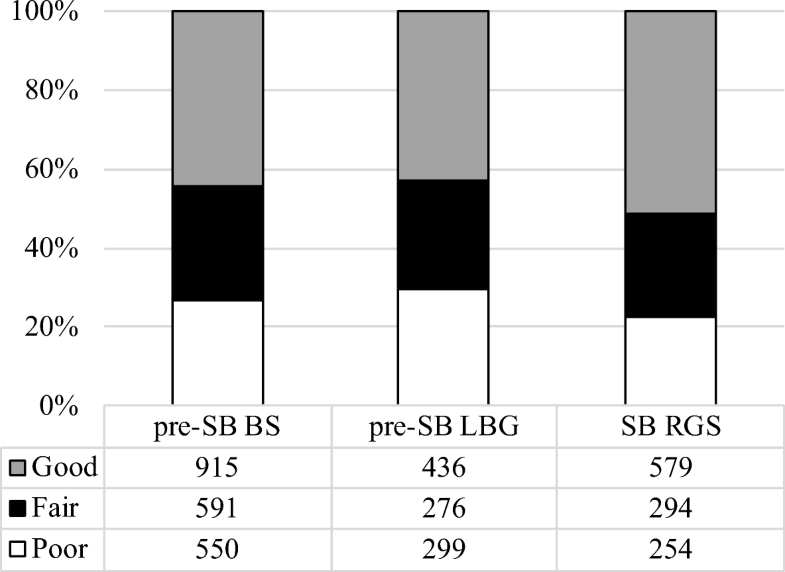 The decline in moderate and highly burned bone evidenced within the pre-SB deposits is not statistically significant (BS vs. LBG: χ2 = 3.551, p = 0.0595); however, the difference between LBG and RGS is (χ2 = 33.74, p < 0.0001). Given that burning promotes fragmentation, the greater frequency of moderately to highly burned bone in the pre-SB could help explain why the fauna from these units appears to be more fragmentary. Given the degree of burning—and because micromorphological analysis indicates that the pre-SB sediments have been affected by trampling (these data are not yet available for the SB, see Wadley et al. 2011)—it would seem apparent that the assemblages under consideration have been impacted by post-depositional destruction. As discussed, the degree of fragmentation among the carpal/tarsal bones (minus the calcaneus; these are also referred to as the “compact bones”) can serve as one means of evaluating the relative extent of this destruction (Marean 1991; Villa et al. 2004)—and whether it is consistent across the three units of analysis. Table 6 presents data on the number of complete/almost complete vs. fragmentary compact bones by size class and time period. The frequency of complete/almost complete carpals/tarsals spans from 0% for the large ungulates from RGS to 76.6% for the small ungulates from BS; these results indicate that the pre-SB and SB fauna has indeed been impacted by post-depositional destruction. When comparing the data across time, no significant difference in the representation of complete/almost complete compact bones was identified for the small and medium ungulates (small ungulates: χ2 = 0.711, p = 0.7008; medium ungulates: χ2 = 0.309, p = 0.8568). The small sample from RGS (n = 7) invalidates the use of a traditional chi-square test for the large ungulate data, as more than 20% of cells have an expected count of less than five. In this case, I applied the Freeman-Halton extension of Fisher’s Exact test (calculations were done using R version 3.4.1 with RStudio version 1.0.153). The p value was 0.0267, meaning that the observed variation is significant. Pairwise testing (based on Fisher’s exact test) indicates that this result is driven by the difference between LBG—where more than 50% of the compact bones are complete—and RGS, where none of them are (BS vs. LBG: p = 0.0894; LBG vs. RGS: p = 0.0225; BS vs. RGS: p = 0.2964). These data suggest that the degree of post-depositional destruction is largely consistent across the three units; however, the lesser degree of fragmentation among the large ungulate carpal/tarsals from LBG is worthy of future attention. The completeness index can also be used to explore whether the remains of large and small animals were equally affected by post-depositional destruction; if the greater surface area of large animal remains makes them more susceptible to post-depositional destruction, this could bias analyses relying on taxonomic abundance data (e.g., Yeshurun et al. 2007). This bias could arguably work in two ways—if the bones of larger animals are more fragmentary, but those fragments still retain identifiable features, it could artificially inflate the frequency of large game. On the other hand, under situations of heavy fragmentation (like that evidenced at Sibudu), this could result in an over-representation of small game, as a less-than-2 cm fragment from a small mammal is more likely to retain diagnostic features than the same size fragment from a larger animal. From a qualitative perspective, the data in Table 6 appear to support the argument that the bones of larger ungulates suffered from greater post-depositional destruction than those of smaller-body animals—the percentage of complete/almost complete compact bones varies from 0 to 53% for the large ungulates but is greater than 70% for the small ungulates in each unit under consideration. From a quantitative perspective, the Cochran-Armitage test provides a means of exploring whether there is significant linear trend in the data (see Cannon 2001 and references therein). Because there may be some differences in the degree of post-depositional destruction over time (at least among the large ungulates), the data from BS, LBG, and RGS are treated independently. The Cochran-Armitage test is a variant of the chi-square test that divides the chi-square statistic in two parts—these are listed in Table 7 as “trend” and “departure”. The former reflects the amount of variability that is associated with a linear trend, while the latter reflects the departure from that trend (Cannon 2001). Both parts are assigned a significance value; a significant p value for trend indicates a significant linear trend, while a significant p value for departure implies that the evidenced variation is not just driven by linearity—some other factor is also at play. As indicated in Table 7, there is a significant linear trend in the data for BS and RGS—as body size increases, so too does fragmentation. This implies that the bones of smaller animals may be over-represented in the assemblages from BS and RGS. Note that RGS also had a significant value for the “departure” statistic, indicating that body size is not alone in driving the evidenced variation. The results also suggest that something different is going on in LBG; not only is there not a significant linear trend in the data, but the chi-square test indicates there are no significant differences in the degree of fragmentation across the ungulate size classes, period. Despite the evidence for post-depositional destruction—something which is often linked to density mediated attrition (Lyman 1994; Munro and Bar-Oz 2004 and references therein)—no significant relationships were identified between element frequency and bone mineral density (Table 8). While this seems counter-intuitive, it is consistent with previous analysis at Sibudu; as discussed by Clark (2017), this is likely an artifact of the degree of fragmentation (see also Lyman et al. 1992). When heavily fragmented, shaft fragments are less likely to retain diagnostic features than epiphyseal fragments, resulting in an under-representation of some of the most dense portions of the skeleton. The data presented in Table 8 provide another potential line of evidence regarding variation in fragmentation by body size—the more fragmentary the remains, the fewer scan sites will be identified. The number of scan sites does tend to vary inversely with size class—the only exception to this is in LBG, where the same number of scan sites were identified for both the medium and large bovids. This is consistent with the results presented earlier, in that LBG was the only unit in which the degree of post-depositional destruction did not seem to be mediated by body size. There are thus two lines of evidence suggesting that the large ungulates remains from LBG are preserved somewhat differently than those in BS or RGS, in that these remains seem to be relatively less fragmentary. The degree and nature of fragmentation suggest that some caution is warranted when considering both taxonomic abundance and element frequency data. Although the extent of post-depositional destruction appears broadly consistent over time, the data suggest that within BS and RGS, the bones of larger animals were more heavily impacted by post-depositional destruction. This means that small animals may be over-represented in those assemblages. The nature of fragmentation would also seem to preclude comparison of skeletal element profiles across size classes. Variation in skeletal part frequencies within each size class may be more meaningful; however, the fact that the large ungulate remains in LBG seem to be less fragmentary provides an additional reason to be wary when interpreting potential variation in the skeletal part data for that size class. The degree of burning represented in the assemblage is also relevant when considering the data on bone surface modifications (Table 9). Previous work at Sibudu has demonstrated an inverse relationship between burning and cortical preservation—the greater the heat damage, the less well preserved the cortical surfaces (Clark 2017; Clark and Ligouis 2010). Given the frequency of burned bone in the pre-SB and SB (refer back to Fig. 6), it is not surprising that the occurrence of bones coded as having good surface preservation is relatively low throughout—these account for 44.5% of the assemblage from BS, 43.1% from LBG, and 51.4% from RGS (Fig. 7). Paralleling the results for heat damage, the variation in cortical preservation within the pre-SB is not statistically significant (BS vs. LBG: χ2 = 2.699, p = 0.1004), but the differences between LBG and RGS are (χ2 = 13.763, p = 0.0002). This has two implications for the analysis of bone surface modifications. First, as indicated in Table 9, the relative frequencies of surface damage are quite low. Given the degree of fragmentation and state of cortical preservation, this is not unexpected. The low frequency of surface modifications may also be a methodological artifact relating to the exclusion of non-identifiable shaft fragments; and yet, as discussed in Clark (2017), the analysis of a sub-sample of shaft fragments from the HP found a similarly low frequency of surface damage as that identified for the identified assemblage. Second, given the variation in cortical preservation, it does not seem appropriate to compare the relative frequency of surface damage across the units—particularly in the case of LBG and RGS. One exception to this relates to the presence of gastric etching. Gastric etching in and of itself causes poor cortical preservation; its identification is only impeded when bone surfaces are obscured—for instance, if the bone is covered in cemented ash. This is a rare occurrence in the pre-SB and SB at Sibudu; as such, variation in frequency of bones bearing gastric etching should be meaningful. I will return to this point below. In evaluating the potential agents of accumulation for the pre-SB and SB fauna, it is relevant to return to a point raised above—that data on bone surface modifications were not collected for the non-identifiable long bone shaft fragments. Midshaft fragments often serve as the focal point for studies of bone surface modifications, particularly when assessing the agent(s) of accumulation for a given faunal assemblage. Data on the relative frequency of surface modifications on these fragments are quantitatively compared with data deriving from experiments involving carnivores and/or human processing (e.g., Faith 2013; James and Thompson 2015; Thompson and Henshilwood 2011; Thompson et al. 2017). However, these studies focus almost exclusively on the interaction between large carnivores (i.e., hyena and lion) and large (Bov III-size) prey (e.g., Blumenschine 1988; Capaldo 1997; Domı́nguez-Rodrigo 1997; Gidna et al. 2014, Pante et al. 2012; Selvaggio 1998). Furthermore, quantitative comparison of experimental and archeological datasets is not always straightforward, particularly when the overall occurrence of surface modifications is low and/or when surfaces are badly preserved (Thompson and Henshilwood 2011; Thompson et al. 2017)—both of which are the case at Sibudu. In a larger sense, it does not seem controversial to argue that humans made an important contribution to the Sibudu fauna—the site contains abundant evidence for human activity—and while analysis of the pre-SB and SB sediments are ongoing, geoarchaeological analyses completed to date indicate the deposits at Sibudu are almost entirely anthropogenic in origin (e.g., Goldberg et al. 2009). Furthermore, carnivores are rare in the assemblage, accounting for no more than 1.4% of the NISP from any of the units being considered here, and most of those are small carnivores like mongoose, which would not significantly contribute to the ungulate fauna. The pre-SB and SB fauna is also heavily fragmented and highly burned. Villa et al. (2004) compare faunal data from a number of Paleolithic sites in order to identify criteria that can help distinguish assemblages primarily produced by human activity vs. those produced by carnivores; this set of characteristics aligns with the expectations for a human-produced assemblage. That being said, it is possible that there is variation in the relative degree of human input, both over time and as relates to different subsets of the faunal assemblage. It is particularly relevant to consider the role played by humans in the collection of small ungulates and other small game, as research at other MSA sites has demonstrated that these fauna were often (but not always) accumulated by non-human predators (Armstrong 2016; Clark 2017; Cruz-Uribe and Klein 1998; Faith 2013; Marean et al. 2000; Thompson and Henshilwood 2011). Table 10 presents data on the distribution of surface modifications by animal type and size class. Evidence for human activity includes cut marks and percussion damage; while gastric etching could also reflect human activity (e.g., Butler and Schroeder 1998; Dewar and Jerardino 2007; Reinhard et al. 2007), this is more likely to reflect ingestion by non-human predators. Because only three specimens bore evidence for carnivore damage in the form of tooth punctures, scores, or gnawing, these were not included in Table 10. A Bov II femur shaft from LBG bore a tooth puncture, while two Bov IV specimens from RGS bore tooth punctures/scores (a 2nd/3rd tarsal and a distal sesamoid); the size of the punctures/scoring on the specimens from RGS is consistent with a small carnivore such as mongoose. In all three units under consideration, signs of human activity are more prevalent on the remains of medium and large ungulates than they are on bones deriving from small ungulates or the miscellaneous smaller game (i.e., mammals with an average mass of less than 25 kg). In fact, only two specimens from the miscellaneous small mammal category bear surface damage indicative of human activity. The first is a small felid (African wild cat size) from layer BS6 which preserves three parallel cut marks (oriented medio-laterally) just above the distal condyle of a metapodial; these are on the plantar surface. The second is a hyrax (Procavia capensis) humerus from BS5 which bears a single cut mark on the distal shaft. While the bones of smaller animals may be less likely to bear this damage because they could be transported and cooked whole, the dearth of evidence for human processing on these specimens could indicate that humans played a lesser role in the accumulation of this fauna. The data on gastric etching would seem to bear this out, as 96% of the bones showing this damage derive from the small ungulates and miscellaneous small mammals. The HP fauna from Sibudu showed a similar pattern (Clark 2017); in that case, the discrepancy in the occurrence of gastric etching between the large and small mammals was used to rule out larger carnivores (including hyena, leopard, and cheetah) as a primary agent of accumulation, as those carnivores should be equally (if not more) likely to consume the bones of medium or large ungulates (see also Marean 1991; Faith 2013). Instead, Clark (2017) proposed that the predators most likely to have contributed to the small game assemblage were medium carnivores, such as the black-backed jackal (Canis mesomelas), caracal (Caracal caracal), or serval (Leptailurus serval), and/or large raptors. In a more general sense, the relatively high frequency of gastric etching in the pre-SB and SB deserves attention. Gastric etching was identified on 2.8% of the remains from BS, 7.5% of the assemblage from LBG, and on 4.3% of the identified bones from RGS. This implies that non-human predators made a greater overall contribution to the pre-SB and SB fauna than was the case in the HP, where only 1.7% of the analyzed sample bore gastric etching (Clark 2017). The frequency of bones from LBG that bear this damage is significantly higher than that identified in BS or RGS (BS vs. LBG: χ2 = 35.851, p < 0.0001; LBG vs. RGS: χ2 = 9.725, p = 0.0018). When the data are broken down by animal type/size class (Table 10), the pattern becomes even more stark. More than 20% of the small ungulates and more than 12% of the miscellaneous small mammals from LBG bear gastric etching—in both cases, this is significantly higher than that from BS or RBG (p values are presented in Table 11). This implies that non-human predators played a particularly marked role in accumulating the smaller animals found in LBG. Returning to an assessment of the non-human predators most likely to have contributed to the assemblage, jackal and serval were both identified in the pre-SB assemblage, and thus these remain likely candidates. While the avian assemblage did not include any large raptors—nor were these implicated in the collection of the smaller birds (Val 2016)—species that are currently present in the region include the Cape eagle owl (Bubo capensis) and Verraux’s and crown eagle (Aquila verreauxii and Stephanoaetus coronatus, respectively). While all of these may have contributed to the collection of small game, the relatively high frequency of gastric etching may be more indicative of activity by a nocturnal vs. diurnal raptor (i.e., owls rather than eagles; Armstrong 2016). The aforementioned mammalian carnivores are known to preferentially target fetal/neonate or juvenile bovids (Ramesh and Downs 2015; Van de Ven et al. 2013); the same is true for at least some of the raptors (Armstrong and Avery 2014). While it is less clear whether these species will also preferentially target young individuals for other small game such hyrax and hare (compare Cruz-Uribe and Klein 1998 with Armstrong and Avery 2014), it would seem relevant to consider the age data, presented in Table 12. While the small ungulates and miscellaneous small game from BS and RGS do not show a markedly different frequency of young animals than that evidenced for the medium and large ungulates, LBG again shows a different pattern. Not only is the frequency of juvenile and fetal/neonate remains from LBG significantly higher for the smaller game than it is for the medium and large ungulates (comparing the pooled sample of small ungulates/misc. small mammals vs. medium/large ungulates provides χ2 = 10.52, p = 0.0012), but LBG also shows the highest overall percentage of young animals for both the miscellaneous smaller game and the small ungulates. Once again, these data support for a greater degree of non-human input in LBG. They are also are consistent with predation by medium carnivores. Finally, as discussed in Clark (2017), the relative frequency of burned bone may serve as another indicator of the degree of human involvement with the small ungulates and small game. While some of the heat damage at Sibudu is likely unintentional, incidental exposure to overlying hearths cannot explain the intensity of burning (i.e., the frequency of calcined bone) or its ubiquity (see Clark and Ligouis 2010 for a detailed discussion of the timing and nature of burning at Sibudu). Both Cain (2005) and Clark and Ligouis (2010) propose that the high frequency of burning at Sibudu is related to the deliberate disposal of food waste. Table 13 presents data on the distribution of heat damage by animal type/archeological horizon. With the exception of the small ungulates from BS, the smaller animals consistently show a lesser degree of heat damage than the medium and large/very large ungulates. Meanwhile, the miscellaneous small mammals from LBG show the lowest frequency of moderate to highly burned bone in the entire assemblage (only 13% of these remains were coded as such). If burning does primarily reflect the disposal of food waste into fire, then these data are again consistent with non-human actors playing a greater role in the accumulation of the smaller fauna, especially in LBG. While these data imply that medium carnivores and/or large raptors played some role in the accumulation of the small ungulates and miscellaneous smaller game in the pre-SB and SB—and that this role may have been significant in LBG—they do not suggest that humans played no role in the collection of this game. Furthermore, the relative frequency of surface modifications associated with human activity and the frequency of burning indicate that humans were the primary contributors to the medium and large ungulate assemblages for all three assemblages under consideration, including LBG. As was the case with the fragmentation data, the data presented here indicate that the taphonomic history of LBG is somewhat distinctive from that of BS or RGS. This highlights the need for caution when interpreting variation in the taxonomic abundance data and when considering skeletal element frequencies. Turning now to the taxonomic data, the relative frequency of species that preferentially occupy open vs. closed habitats can be informative about the nature of the local environment—and about changes in that environment over time. However, given that humans (and other predators) may not collect fauna in direct proportion to their availability on the landscape, these data are most powerful when combined with other datasets that speak to environmental conditions. The habitat preference data are presented in Fig. 8; note that unless all members of a given genus share similar habitat preferences, this analysis was limited to species-level identifications (see ESM Table S2 for the assignment of species to habitat type and the raw data). Taxa that preferentially inhabit closed environments dominate the assemblage, accounting for more than 90% of the sample from each horizon. The two most common species in all three units are blue duiker (Philantomba monticola) and bushpig (Potamochoerus larvatus), both of which prefer forested habitats. These are followed by vervet monkey (Chlorocebus pygerythrus) in BS and LBG and Sykes’ monkey (a.k.a samango, Cercopithecus albogularis) in RGS. This combination of species is common in evergreen forests across the southern African subregion (including KwaZulu-Natal), where blue duiker and bushpig subsist in part on fruit dropped to the forest floor by troops of monkeys (Cooper 1985; Skinner and Chimimba 2005). Although species that prefer open habitats are rare, a diverse range of taxa has been identified, including warthog (Phacochoerus africanus), African buffalo (Syncerus caffer) and equids (Equus sp. ), suggesting that the pre-SB and SB inhabitants of Sibudu had at least some access to open woodland/savannah-like environments. These open-dwelling species may have also been drawn to the vicinity by the presence of the uThongathi River. Chi-square tests indicate no significant variation in the relative frequency of open vs. closed-dwelling species over time—this is true both within the pre-SB as well as between the pre-SB and the SB (total assemblage: χ2 = 3.490, p = 0.4794; BS vs. LBG: χ2 = 0.933, p = 0.6272; LBG vs. RGS: χ2 = 2.9, p = 0.2346). It is worth noting that when MNI is used instead of NISP, fauna from closed environments still dominate the assemblage and any difference between the layers remains statistically insignificant (results in ESM Table S3). A slightly less conservative treatment of the data involves expanding the sample to include those remains identified as most likely belonging to a given species (indicated with “cf.” in Table 4); however, the results are again unchanged (ESM Table S3). These results are consistent with those deriving from analyses of the avian fauna, charcoal, and isotopic data, all of which suggest that forest comprised an important component of the vegetation near the site (e.g., Lennox and Wadley 2019; Robinson and Wadley 2018; Val 2016). The implications of this will be considered further in the discussion. Ungulates make up the majority of the identified fauna; in this section, I will explore various aspects of the ungulate assemblage, incorporating taxonomic and taphonomic data as well as data on skeletal part frequencies. In assessing the relative degree of fragmentation across the pre-SB and SB, I identified significant variation in the ungulate size class data, with small ungulates increasing over time (Fig. 5). Looking at the species-level identifications, this pattern appears to be driven primarily by variation in the presence of blue duiker, which accounts for 17.4% of the identified assemblage in BS, 21.8% in LBG, and 41.1% in RGS. 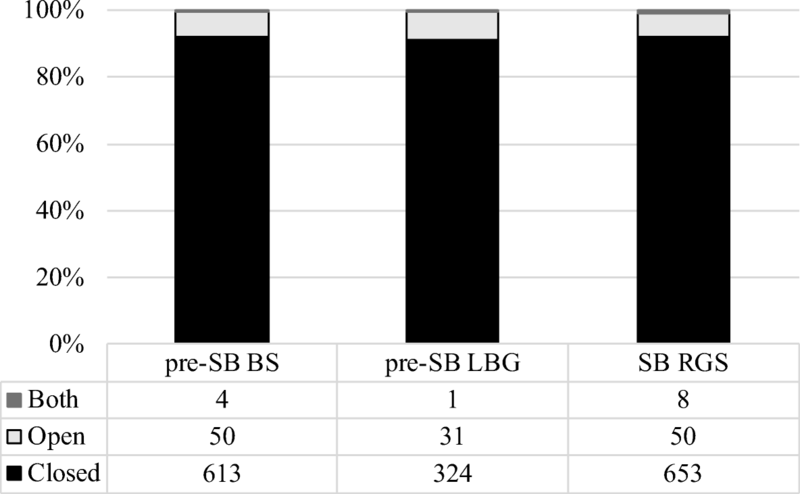 These differences are statistically significant, both within the pre-SB and between the pre-SB and the SB (total assemblage: χ2 = 271.375, p < 0.0001; BS vs. LBG: χ2 = 9.851, p = 0.0017; LBG vs. RGS: χ2 = 107.962, p < 0.0001). In fact, blue duiker is the most frequently identified species in the assemblage, accounting for 25.1% of the total NISP (n = 1234). The prevalence of blue duiker is not unique to these layers—the species is also common in the HP, where it accounts for ~ 33% of the total NISP (Clark 2017). As discussed in Clark (2017), there are at least two reasons why blue duiker could be over-represented relative to other species. First, with an average mass of 4.5 kg (Skinner and Chimimba 2005), blue duiker is by far the smallest bovid represented in the assemblage. As such, their bones could often be identified based on size alone; identifying other bovids to the species-level required teeth or other rare diagnostic elements. Second, as already mentioned, in a heavily fragmented assemblage, the bones of smaller animals are more likely to preserve diagnostic features than those of larger species, making them easier to identify. While this should apply to all three units of analysis, the taphonomic data also suggested that in BS and RGS—but not LBG—the bones of larger species were more heavily impacted by post-depositional destruction than those of smaller animals, compounding this potential source of bias. Given that the relative degree of fragmentation appeared to be more intensive in BS than RGS, one may thus expect BS to show the strongest bias in favor of small animals. However, blue duiker are significantly more common in RGS than in BS (χ2 = 255.715, p < 0.0001). This implies that the temporal variation in the presence of blue duiker is meaningful and not simply a factor of taphonomic variables. Clark and colleagues propose the HP inhabitants of Sibudu may have taken blue duiker using remote capture technology such as snares, traps or nets (see Clark 2011, 2017; Clark and Plug 2008; Wadley 2010). This hypothesis was based on a consideration of ethnoarchaeological and ecological data. Blue duiker are a major source of bushmeat for modern foragers in central Africa; while some communities rely on net hunting to capture blue duiker, others primarily utilize snares (Lupo and Schmitt 2005; Yasuoka 2006; Yasuoka et al. 2015). In discussing the use of blue duiker within the southern African subregion, Skinner and Chimimba (2005) note that blue duiker are territorial and have routine movement patterns within their territory; people exploit this behavior by placing snares across known paths. Given that the species is small, quick, and preferentially occupies regions with dense underbrush, the fact that modern groups rely primarily upon remote capture technology is not surprising. While these technologies are unlikely to preserve in the archeological record, the high frequency of blue duiker in the HP—and the fact that taphonomic data were consistent with the species being collected primarily by humans—led Clark and colleagues to argue that remote capture technology may have been in use (Clark 2011, 2017; Clark and Plug 2008; Wadley 2010). In thinking about the agents of accumulation and possible methods of capture for the blue duiker identified in the pre-SB and SB deposits at Sibudu, it is relevant to return to the surface modification data. Gastric etching was identified at the highest frequencies in the small ungulate assemblage—and blue duiker make up the majority of the small ungulate remains. In fact, ~ 77% of all bones bearing gastric etching come from blue duiker—11.5% of all blue duiker bones bear this damage. Compare this to the HP, where a similarly high frequency of bones bearing gastric etching came from blue duiker (accounting for ~ 64% of all gastrically etched bones), but where only 1.7% of total blue duiker sample showed this damage. Again, unless the gastric etching reflects human digestion, these data imply non-human predators played a significantly greater role in the accumulation of blue duiker in the pre-SB and SB than in the HP. Breaking down the data by time period, gastric etching is present on 10.9% of the blue duiker from BS, 23% from LBG and 6.9% from RGS; the frequency of this damage is significantly higher in LBG than in the other two units (BS vs. LBG: χ2 = 14.415, p = 0.0001; LBG vs. RGS: χ2 = 43.785; p < 0.0001). If blue duiker were primarily collected by non-human predators, one might expect their frequency to co-vary with evidence for gastric etching, and yet, that is not the case. As indicated above, blue duiker are actually the most frequent in RGS, which also has the lowest frequency of gastric etching; not only is the frequency of digested remains significantly lower in RGS than LBG, it is also significantly lower than in BS (χ2 = 10.188, p = 0.0001). While cut marks on blue duiker bones are rare, RGS also preserves more bones with this damage—seven, found on elements throughout the skeleton, including the mandible (2), innominate (2), talus (2), and radius (1), while LBG only has one (a talus) and BS has none. This implies that humans played a greater role in the accumulation of blue duiker during the SB—and if one wanted to draw a linkage between blue duiker exploitation and the use of remote capture technology, the use of this technology may pre-date the HP, although the nature of the data is such that this possibility would seem to be stronger for the SB than the pre-SB. For blue duiker—and for the rest of the ungulate assemblage—the element data can potentially be informative about variation in the treatment of carcasses over time. NISP counts for each anatomical unit can be found in Table 14, while Fig. 9 presents anatomical unit profiles for the ungulate assemblage; element-level data can be found in ESM Table S4. Note that equids and very large ungulates have been excluded from Fig. 9 due to their small sample sizes. As discussed in the methods section, anatomical unit profiles were created by correcting the number of bones from each anatomical unit by the number that occurs in that unit in a complete skeleton, and axial parts were excluded because of the difficulty of assigning heavily fragmentary ribs/vertebrae to size class. Note, too, that because the only blue duiker sesamoid recovered at Sibudu was found when a sample of fine-screen material was being processed (suggesting they are too small to be recovered in the 2 mm screen), sesamoids were not taken into account when correcting for the number of foot bones for that species, so as not to artificially deflate the representation of foot elements. Two aspects of these data are noteworthy. First, the observed frequency of bones within each anatomical unit can be statistically compared to that expected from a complete skeleton in order to evaluate whether the data are consistent with complete carcasses being brought into the site. Results are presented in Table 15; notably, only three significant differences were identified in the entire assemblage. Second, although there is some variation across the layers (particularly for the large bovids), the data suggest fairly consistent treatment of carcasses over time. Given that ethnoarchaeological research among modern hunter-gatherer groups has found that smaller prey (Bov I or II size) are often transported whole (see Oliver 1993 for an example from the Hadza), these results in many ways seem logical—especially since two of the three cases deviating from the pattern are large bovids (Bov III/IV). The other exception is found in the blue duiker from RGS; the adjusted residuals indicate that significance was driven by a lower than expected number of foot elements. Given that blue duiker average 4.5 kg, they would presumably be transported whole, so there is not an immediately obvious explanation for the under-representation of foot bones in RGS. In a general sense, it is difficult to explain why fragmentation should cause such a specific and consistent pattern in the skeletal part data; and, in fact, the HP fauna from Sibudu is also highly fragmentary, but shows more variation in the skeletal part profiles (Clark 2017). And yet, taphonomic analysis did suggest that the large ungulate remains in LBG were relatively less fragmentary than those from BS and RGS—and it is the large bovids from BS and RGS that show a deviation from the pattern expected if complete carcasses were being brought to the site. Looking at the comparison between the observed and expected distribution of skeletal parts in greater detail, the adjusted residuals indicate that significance is driven primarily by a relative over-abundance of foot elements in both BS and RGS. The tendency for large ungulates to show an over-representation of head and foot bones is well documented in MSA sites. While this was historically viewed as an indication of scavenging behavior by MSA hominids, it was later argued that this pattern reflects a taphonomic bias driven in large part by the exclusion of long bone shaft fragments (e.g., Faith and Gordon 2007; Klein 1989; Marean and Frey 1997). As previously discussed, long bone shaft fragments were included in the current study, providing they preserved diagnostic features that allowed them to be identified to element. Furthermore, it is only the foot elements that are over-represented, not the head. Because the large ungulate bones from BS and RGS appear to be more heavily impacted by post-depositional destruction, and because when broken into similar sized fragments, smaller bones are more likely to retain diagnostic features than large ones—and the foot bones, which comprise the phalanges and the sesamoids, are among the smallest in the skeleton—this particular pattern could, in fact, be driven by fragmentation. Does this mean that we can accept the data from LBG as more directly reflecting human behavior, suggesting transport of relatively complete carcasses, even for the large bovids? This may be the case; however, as previously discussed, there are reasons to be wary of this dataset. While it is beyond the scope of the current paper, a broader exploration of the impacts of fragmentation on the element data and their utility for addressing questions relating to human transport and processing is warranted. Turning to other aspects of the ungulate data, given their tendency to be aggressive—and thus potentially dangerous to hunt—the presence (or absence) of suids in the MSA record has been used as evidence of the hunting prowess (or lack thereof) of MSA humans (e.g., Dusseldorp 2010; Faith 2008, 2011; Klein and Cruz-Uribe 1996, 2000; Weaver et al. 2011). The frequency of suids in the HP and post-HP MSA at Sibudu, where they account for 10.9% and 8.1% of the NISP, respectively, led Clark and colleagues to argue that the inhabitants of Sibudu were proficient at capturing dangerous game (Clark 2011, 2017; Clark and Plug 2008). Suids are present in relatively high frequencies in the pre-SB and SB at Sibudu, accounting for 21.8% of NISP in BS (n = 519), 17.8% in LBG (n = 206), and 10.8% in RGS (n = 149). The decline in suids over time is statistically significant (total assemblage: χ2 = 73.281, p < 0.0001; BS vs. LBG: χ2 = 7.782, p = 0.0053; LBG vs. RGS: χ2 = 25.903, p < 0.0001). Both warthog and bushpig have been identified in each of the three units under consideration; however, bushpig dominates among those remains identifiable to species. This suggests that most of the remains identified as “Suid” in Table 4 also derive from bushpig. It was proposed that at least some of the suids in the HP and post-HP may have been taken using projectile weaponry or remote capture technology, both of which would reduce the risks (and thus the costs) associated with the capture of this game (Clark 2011, 2017; Clark and Plug 2008; Wadley 2010). This argument relied in part on the fact that suids are more common in the HP and post-HP than in the later deposits at Sibudu; they account for 6.4% of the NISP in the late MSA (Wadley et al. 2008) and only 0.2% in the final MSA (Collins 2016). Analysis of the lithics and a bone point from the HP does support the use of bow and arrow technology during this period (e.g., Backwell et al. 2018; Lombard and Phillipson 2010). As was the case with blue duiker, the argument regarding the use remote capture technology relies on a combination of ecological and ethnoarchaeological data. Bushpig preferentially occupies forests with dense underbrush, is primarily nocturnal and known to be highly aggressive. They are also territorial and regularly patrol these territories; this knowledge can be exploited to place snares or pit traps (Skinner and Chimimba 2005). Research among modern hunter-gatherers in Cameroon shows that bushpig are commonly taken using snares (Yasuoka 2006; Yasuoka et al. 2015), but note that these snares are made of metal wire; wire snares are sturdier and may be more suitable for capturing bushpig than those made of organic materials. What do the data from the pre-SB and SB suggest about the agents of accumulation and possible methods of capture for suids? Gastric etching is extremely rare on suid remains; only four bones bear this damage (accounting for 0.5% of the total sample—two are from BS, and one each from LBG and RGS), and all are distal limb or foot elements. The non-human predators identified as the most likely contributors to the assemblage (i.e., medium carnivores such as jackal and/or large raptors) do not typically prey on suids (e.g., Armstrong and Avery 2014; Ramesh and Downs 2015; Van de Ven et al. 2013). Gastric etching on the suid remains could thus reflect scavenging or the activity of a larger carnivore such as leopard. Cut marks are more common than gastric etching, but these, too, are rare—cut marks were identified on 10 bones (five from BS, two from LBG, and three from RGS). These are distributed across the skeleton, being identified on a maxillary fragment, several forelimb elements, and the distal limbs/feet. The age data show a focus on adult remains; juvenile and fetal/neonate remains make up only 4.8% of the assemblage in BS (n = 25), but account for 9.7% of the assemblage from LBG (n = 20) and 9.4% from RGS (n = 14). When considered alongside the evidence for burning (39.3% of the suid remains from BS, 40.8% in LBG and 34.2% in RGS are at least moderately burned), the data are consistent with humans being a primary contributor to the suid assemblage. Because analysis of the pre-SB lithics has yet to be published, it is not possible to evaluate whether any of the stone tools from BS or LBG may have served to tip projectiles. Looking to the SB, Soriano et al. (2015:14) state that “a few diagnostic impact scars” have been identified on points from RGS, which may reflect their use as tips of throwing or thrusting spears. As such, we do not currently have evidence for projectile use during the periods under consideration. Particularly when considered alongside the evidence for the exploitation of blue duiker, the suid data indicate that the use of remote capture technology should not be ruled out for either the SB or the pre-SB. It is also worth noting that not only are suids present at the highest frequency in BS, but that layer also shows the greatest focus on adult remains (this difference, too, is significant; BS vs. LBG: χ2 = 6.062, p = 0.0138; BS vs. RGS: χ2 = 4.415, p = 0.0356); this could indicate that suids were taken using different methods during that period. Finally, very large ungulates are rare throughout the assemblage (NISP = 29, accounting for only 0.6% of the total NISP). Specimens identified include an upper molar fragment from LBG that was assigned to Loxodonta africana (African savanna elephant) and a tarsal and several foot elements identified as rhinoceros (found in LBG and RBG). Tusk fragments identified as belonging to (or closest to) Hippopotamus amphibious (hippopotamus) are present throughout the pre-SB and SB sequence; these were found in layers BS14, BS11, BS8, BS, LBG3, LBG, RGS2, and RGS. As indicated in Table 14, the very large ungulate sample is dominated by teeth and foot elements. Particularly given the small sample size, it is difficult to judge whether these remains reflect active hunting or scavenging; regardless, we argue that they were most likely introduced to the site by human activity. The most compelling evidence for this comes in the form of two hippopotamus foot bones recovered from the SB deposits, where a complete third phalanx and a nearly complete first phalanx each bore a series of parallel cut marks. Given that they were found in the same layer and sub-square (RGS2, B6a), these may derive from the same individual. The hypothesis that remote capture technology was being utilized by the HP inhabitants of Sibudu was based not only on the frequency of blue duiker and suids, but also on the frequency and diversity of small mammals present in the assemblage (Wadley 2010). Clark (2017) found that the frequency of miscellaneous small mammals (< 25 kg) declined over the course of the HP, accounting for 15% of the assemblage from the lowermost layer of the HP (Pinkish Gray Sand, or PGS) but only 6.3% of the uppermost layer (Gray Rocky, or GR; Clark 2017). Given that only 1.4% of the total assemblage of small mammals from the HP bore gastric etching, Clark (2017) argued that humans did contribute to the collection of this material, although the methods of capture were not clear. Looking at the data from the pre-SB and SB, miscellaneous small mammals make up 8.1% of the total NISP in BS (n = 192), 9.3% in LBG (n = 108) and 10.4% in the RGS (n = 144). This variation is not statistically significant (χ2 = 5.032, p = 0.0808). 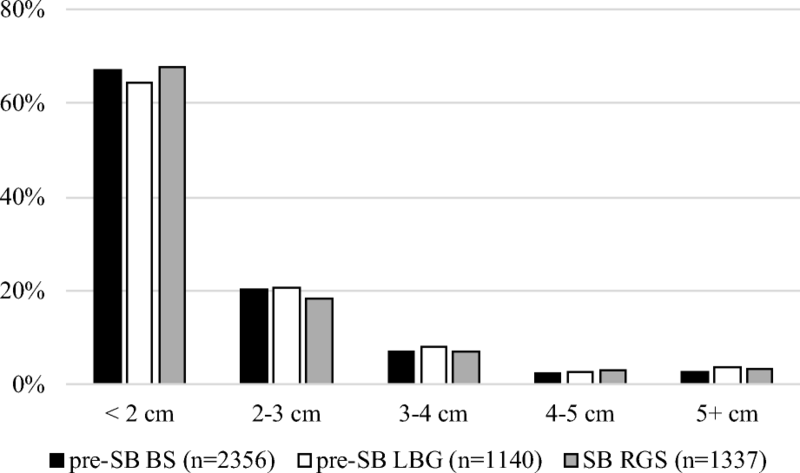 The small game from the pre-SB and SB does generally show a higher degree of gastric etching than that evidenced in the HP; however, as previously discussed, the relative frequency of bones bearing this damage varies significantly over time, being identified on more than 12% of the assemblage from LBG, but only 3.5% in RGS and less than 1% of the assemblage from BS. Of the eleven bones from LBG bearing gastric etching, six (54.5%) derive from a single species: the Gambian giant rat (Cricetomys gambianus)—in fact, nearly half of the giant rat specimens from LBG bear this damage. Another three are found on vervet and Sykes’ monkey (meaning 14.3% of these remains bear gastric etching). The final two bones with gastric etching are a hyrax femur (Procavia capensis) and an ulna identified as Lepus/Pronolagus. It is this same range of species that bears gastric etching in BS and RGS; the single specimen from BS with gastric etching is a calcaneus identified as giant rat, while three of the four bones from RGS with gastric etching are from vervet and/or Sykes’ monkey (the last is a bone identifiable only as “small mammal”). However, this means that only 5% of giant rat specimens from BS and 7.5% of vervet/Sykes’ monkey from RGS bear this damage. The species bearing gastric etching do mesh with the expected prey of the mammalian carnivores and/or birds of prey, and particularly for LBG, it is difficult to argue that humans made a significant contribution to their collection. The same cannot be argued for the remainder of the assemblage, particularly for BS—as mentioned, the two small mammal bones bearing cut marks both came from BS, and BS also showed a higher frequency of burned bone from this category (28.6% were moderately to highly burned, compared to 13% in LBG and 16.7% in RGS—this difference is significant: BS vs. LBG: χ2 = 9.742, p = 0.0018; BS vs. RBG: χ2 = 6.535, p = 0.0106). Citing ethnoarchaeological work by Lupo and Schmitt (2002), Wadley (2010) argued that the diverse assemblage of carnivores in the HP served as additional sign that snares and traps may have been in use. While carnivores are rare in both the pre-SB and SB deposits at Sibudu, accounting for 1.1% of the assemblage in BS, 1.4% in LBG, and 1.1% in RGS (this difference is not statistically significant, χ2 = 0.66, p = 0.7189), BS does preserve the highest diversity of carnivores. Discounting taxa in which the remains could technically represent the same species (e.g., Canis mesomelas vs. cf. Canis mesomelas vs. Canid small/medium) the BS assemblage contains seven distinct taxonomic entries, vs. four in LBG and three in RGS. Taken as a whole, then, while non-human actors played an important role in collecting the miscellaneous small game from LBG—particularly for giant rat and the small/medium primates—that role appears to have been less in RGS. Meanwhile, the data suggest humans were the primary contributor to the assemblage of miscellaneous smaller game in BS—and the nature of the BS assemblage is again consistent with the possible use of remote capture technology. This analysis has highlighted several key points regarding the pre-SB fauna at Sibudu. First, the results underscore the importance of treating BS and LBG as distinct entities, rather than combining them into one analytical unit. There are marked differences in the two faunal assemblages, one of the most notable being that non-human predators appear to have played a significantly greater role in the accumulation of the LBG fauna. It is important to keep in mind that the evidence for carnivore activity is largely restricted to the small ungulates and the miscellaneous smaller game; while gastric etching was identified on 20.4% and 12.6% of these remains, less than 1% of the medium/large ungulates bore evidence for tooth marks or gastric etching. That being said, not only was the frequency of gastric etching on small ungulates and other small mammals significantly higher in LBG than in BS, but the data also suggest that carnivores played a great role in accumulation of this game during LBG than in any of the later deposits at Sibudu (e.g., Clark 2009; Clark 2017; Clark and Plug 2008; Collins 2016). From a taphonomic perspective, LBG was also unique among the three assemblages analyzed here in that the bones of large ungulates were not more heavily impacted by post-depositional destruction than those of smaller animals (as one would expect based on their greater surface area); in a general sense, the large ungulate specimens from LBG appear to be less fragmentary than those from BS (or from RGS). One possible explanation for the differences between BS and LBG is that Sibudu was inhabited less frequently during LBG, which could have both allowed more opportunity for carnivore accumulation and resulted in less trampling. However, in the absence of appropriate lithic and geoarchaeological data, it is difficult to reconstruct changes in occupational intensity. While we are forced to rely on indirect evidence for the use of remote capture technology in the MSA—and while aspects of the fauna from all three of the assemblages discussed here suggest this technology may have been in use—the case is arguably the strongest for BS. First, suids are present at a high frequency in BS, accounting for 21.8% of the NISP; they are also significantly more common in BS than in LBG or RGS. While I do not question the ability of MSA humans to take down dangerous prey at close quarters (as when employing spears), as previously discussed, the use of remote capture technology would serve to significantly reduce the risks—and costs—associated with the capture of this species. The behavior of the species is also conducive to the use of snares or pit traps. Second, while the overall frequency of miscellaneous small game is no higher in BS than in LBG or RGS, BS is unique in that it is the only unit in which direct evidence for human interaction (cut marks) is more frequent than gastric etching; the high frequency of burned bone in this category also supports humans as the primary accumulator of this fauna. Although the frequency of carnivores is low (1.1% of the assemblage), the diversity of carnivores is highest in BS, which is also consistent with the use of remote capture technology (see Wadley 2010 for a detailed discussion). The data thus indicate the use of snares and or traps may extend back to at least 77,000 years ago. The argument that BS and LBG should be considered independently is supported by unpublished data on the ochre assemblage (data provided by T. Hodgskiss). As previously mentioned, the pre-SB preserves the highest frequency of utilized ochre in the Sibudu sequence (21.5%); however, when the pre-SB is broken down into its two component units, a different pattern emerges. While 26.2% of the ochre from BS was utilized, only 9.4% of that from LBG shows evidence for use. This means that LBG has the second lowest frequency of utilized ochre in the entire sequence (the final MSA had the lowest frequency, at 5.5%). Furthermore, of the seven pieces from the pre-SB bearing evidence for engraving or “light and intensive scoring”, all but one were found in the BS deposits (Hodgskiss 2013). When considered alongside the data on ochre use—and the evidence that the BS inhabitants of Sibudu specifically selected aromatic leaves containing insecticidal and larvicidal chemicals to serve as the top layer of the plant-based bedding they constructed (Wadley et al. 2011)—the data presented here suggest that the SB and HP are not unique in preserving evidence for a suite of innovative behaviors. While the lithics from BS have not yet been published, Conard’s team analyzed a collection of serrated points recovered from the deposits underlying BS (these deposits are currently undated). Rots et al. (2017) propose that these points were produced by pressure flaking and that they served to tip projectile weapons. These findings underscore the need for more detailed analyses of the pre-SB record at Sibudu. It is worth reiterating here that Sibudu is not unique in preserving evidence for innovative behaviors that pre-date the SB. Noteworthy examples include the use of heat treatment in the production stone tools as early as ~ 164 ka at Pinnacle Point (Brown et al. 2009) and evidence for an ochre-processing workshop at Blombos dating to ~ 100 ka (Henshilwood et al. 2011). There is an on-going back and forth in the literature about the relationship between the onset of the SB and a period of environmental degradation and/or increased instability caused by the shift to MIS 4 (e.g., Bar-Matthews et al. 2010; Jacobs et al. 2008a; McCall and Thomas 2012; Roberts et al. 2016). The pre-SB and SB fauna at Sibudu is dominated by taxa that preferentially inhabit closed (and particularly forested) habitats; there were no significant changes in the relative frequency of open vs. closed-dwelling fauna spanning from BS to RGS. This is consistent with data from the avian fauna (Val 2016), analysis of charcoal (Lennox and Wadley 2019) and isotopic data (Robinson and Wadley 2018). It would thus appear that at Sibudu, the onset of the SB is not correlated with marked changes in the local environment. However, as discussed by Carr et al. (2016), the linkages between environmental change and behavioral change are extraordinarily complex. Just as correlation does not equal causation, I would argue that a lack of correlation does not necessarily imply a lack of causation. Subtle changes in climate may have significant ramifications on the presence and distribution of key resources; however, the nature and resolution of the archeological record hinders our ability to identify and/or tease apart subtilties. Our ability to assess the factors that may have contributed to the onset of the SB at Sibudu is in part limited by the absence of broader contextual data for the pre-SB. For instance, reconstructing changes in landscape use will require the incorporation of data from a number of sources, including lithics, charcoal, and the geoarchaeological record. One of the more noteworthy aspects of the SB fauna is the high frequency of blue duiker. The species accounts for 41.1% of the total NISP; this is significantly higher than that present in BS or LBG. Although the overall number of specimens bearing cut marks is low, not only does RGS preserve more of these marks than LBG or BS, but it also shows the lowest frequency of blue duiker remains bearing gastric etching. This suggests that humans played a greater role in the accumulation of blue duiker during RGS. Under the tenets of optimal foraging theory, the small size of blue duiker would make them low ranked prey—and, as such, the relative frequency at which they are taken should not track variation in their presence on the landscape. Rather, the presence of low ranked resources should increase when the availability of higher ranked resources has declined (Kelly 2013). Of course, the use of remote capture technology could impact the relative prey rank of blue duiker. There are a number of possible explanations for the increased presence of blue duiker in RGS; I would like to introduce three here. First, if the use of remote capture technology increased the relative prey rank of blue duiker, shifts in their relative frequency may indeed track their presence on the landscape. The extent of the forest surrounding the site appears to have been broadly similar over time, implying that the availability of this prey may have also been relatively constant. However, longitudinal research among modern foragers in Cameroon has documented that blue duiker are better able to withstand human hunting pressure than larger duiker (which have also been identified at Sibudu); under “moderate” human intervention, blue duiker became more densely distributed on the landscape, and in certain locations, the density of blue duiker remained high even in cases of extensive human intervention (Yasuoka et al. 2015; note that in this case, blue duiker are taken primarily via snaring). The increase in blue duiker could thus reflect an increase in their availability on the landscape driven in part by human predation. Second, if we want to consider blue duiker as low ranked prey, the increased focus on this species during the SB may be evidence of subsistence intensification (this was also argued for the HP, see Clark 2011). Finally, the increased frequency of blue duiker in RGS could reflect shifts in settlement patterns and/or landscape use that resulted in a more intensive exploitation of the forest immediately surrounding the site. These explanations are not mutually exclusive; determining which are more likely will require a consideration of a broader subset of data from the SB. 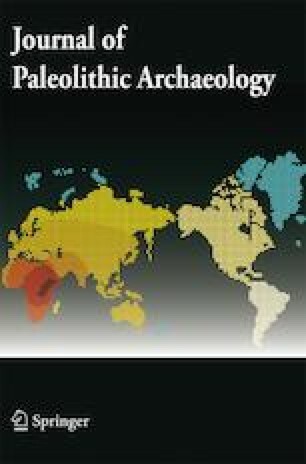 While it is beyond the scope of the current paper, we now have sufficient data from the SB to begin building a more nuanced picture of human lifeways, especially as relates to landscape use—the data presented here can be combined with information on raw material selection and lithic production strategies and use (e.g., Archer et al. 2016; Lombard 2006; Soriano et al. 2009, 2015; Wadley 2007; Wojcieszak and Wadley 2018), as well as data on ochre use (Hodgskiss 2013) and the use of marine resources, both for the production of shell beads (d'Errico et al. 2008) and more generally (Plug 2006). The Sibudu fauna can also speak to the transition between the SB and the HP. At first glance, the fauna from the SB (RGS) looks remarkably similar to that from the HP, particularly when compared to lowermost HP layer, Pinkish Gray Sand (PGS; Table 16; data from PGS from Clark 2017). Fauna from closed environments dominates in both RGS and PGS. The two assemblages show a similarly high frequency of blue duiker and they include a nearly identical proportion of juvenile or fetal/neonate blue duiker. However, RGS does show a higher frequency of blue duiker with gastric etching, implying a greater degree of input by non-human predators during the SB. Suids are also present in similar frequencies. The percentage of miscellaneous smaller game is lower in RGS, but gastric etching is more frequent, suggesting a greater degree of non-human accumulation for this subset of the fauna, as well. Given that the lithics from the SB and the HP are so distinctive (Soriano et al. 2015; but see also de la Peña 2015; de la Peña and Wadley 2014a, b; de la Peña et al. 2013; Wadley and Mohapi 2008), perhaps even reflecting the use of different weapons systems—i.e., hand cast or thrust spears in the SB and projectile/bow and arrow technology in the HP—the broad similarities in the fauna from RGS and PGS are intriguing. This is particularly the case given that McCall and Thomas (2012) propose that the SB and HP reflect two distinct systems of technological organization, shaped by shifts in landscape use and foraging strategies. An in-depth comparison of the SB and HP fauna—one that takes into consideration taphonomic variables—is clearly warranted. Because PGS was thick enough to be divided into three spits (PGS, PGS2, PGS3), the resolution of the comparison can potentially be improved upon; analysis is currently underway. As one of the few sites that preserves deposits from both the SB and HP—and the periods immediately preceding and post-dating these phenomena—Sibudu provides insight not only on the onset and disappearance of these industries—but also on the transition between them. As a source of information on site formation/disturbance, past environmental conditions and human subsistence strategies, the faunal record has a key role to play; the focus here was on taphonomic and taxonomic analysis of the macromammalian fauna from the pre-SB and SB. As is the case in the later deposits at Sibudu, the pre-SB and SB fauna is both highly fragmented and heavily burned—a majority of identified specimens were less than 2 cm in maximum dimensions, and at least 25% of the bone from each unit was coded as moderately or highly burned. Given that burning promotes fragmentation (e.g., Costamagno et al. 1998, 2005; Stiner et al. 1995), these two characteristics of the assemblage would appear to be linked. Because burning can negatively impact surface preservation, the low occurrence of bone surface modifications evidenced on the pre-SB and SB fauna was not unexpected; this, too, is a general characteristic of the Sibudu fauna. When combined with the high frequency of burning and the heavy fragmentation, the available data suggest that pre-SB and SB fauna were primarily accumulated by human activity. However, the presence and frequency of gastric etching indicate that carnivores played a greater role in the accumulation of small ungulates and miscellaneous smaller game during the pre-SB and SB than during later periods. This role was particularly marked in the upper portion of the pre-SB sequence; more than 20% of the small ungulates and 12% of the miscellaneous small game from LBG shows gastric etching. The nature of the damage is consistent with the activity of a medium carnivore (i.e., jackal, serval, or caracal) and/or a large raptor. Future work should include a consideration of bone surface modifications on the non-identifiable long bone shaft fragments (e.g., Faith 2013; Thompson and Henshilwood 2011; Thompson et al. 2017); this work will be important in confirming the seemingly negligible role played by large carnivores such as hyena. The pre-SB and SB fauna is dominated by taxa that preferentially inhabit closed environments; the two most common species-level identifications in all three assemblages were blue duiker and bushpig, both of which prefer forested habitats with dense underbrush. This is consistent with available data from the charcoal, avian fauna, and isotopic data (Lennox and Wadley 2019; Robinson and Wadley 2018; Val 2016), all of which indicated an important forest component, although it is important to keep in mind that those analyses either viewed the pre-SB as a single analytical unit or, in the case of Lennox and Wadley (2019), did not consider material from LBG. While this suggests that the onset of the SB is not correlated with environmental change at Sibudu, it was argued here that this does not mean that climate change played no role in its appearance—we need more data on the regional environment and on landscape use. The data indicate that the pre-SB and SB inhabitants at Sibudu exploited a diverse range of prey—and that they utilized a diverse range of hunting techniques to capture this prey. Ungulates make up the majority of the identified fauna. As was the case in the HP, blue duiker (the smallest bovid in the assemblage, at ~ 4.5 kg) is present in high frequencies, although there is significant variation in the presence of this species over time. Blue duiker accounts for ~ 17% of the assemblage from BS (the lower-most pre-SB unit under consideration), but more than 41% of the assemblage from RGS. Suids are also common, suggesting proficiency at hunting dangerous game. Suids actually show the opposite pattern as blue duiker—they are most common in BS, where they account for more than 21% of the assemblage, and decline thereafter (making up 10.8% of the assemblage from RGS). A diverse assemblage of smaller game is also represented, including primates, carnivores, and large rodents; however, as discussed above, non-human predators contributed to the collection of these remains. Only in BS does evidence for human collection of small game exceed that for carnivore accumulation; it was argued that humans were primarily responsible for the collection of this subset of the assemblage during that period. The strong focus on suids and evidence for human collection of the smaller fauna in BS—and the high frequency of blue duiker in RGS—suggest that remote capture technology (snares and/or traps) may have been employed during both the pre-SB and SB. The use of this technology at Sibudu could thus extend as far back as 77,000 years ago. 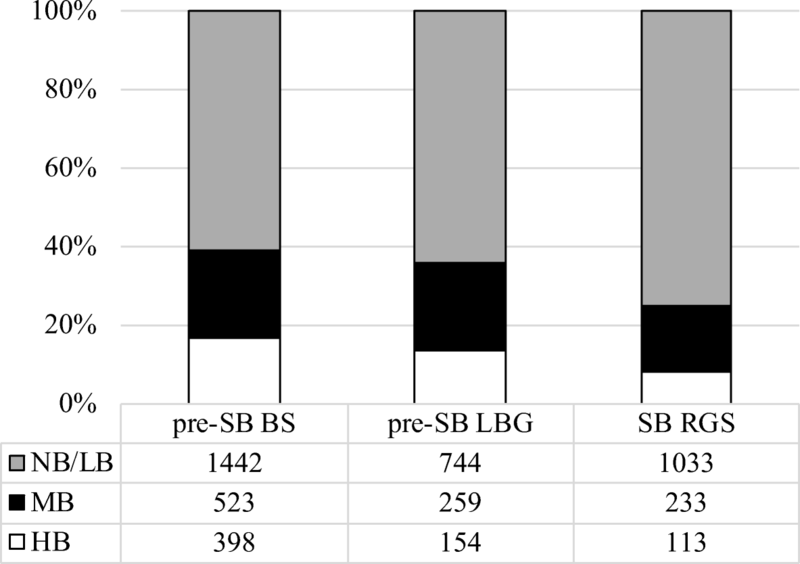 The data presented here highlight the importance of treating the BS and LBG members independently, rather than combining them into one “pre-SB” analytical unit; it was proposed that differences between the two assemblages may suggest that occupation of the shelter was less intensive during LBG. When considered alongside a growing body of evidence for other complex/innovative behaviors, the faunal data—particularly that relating to the potential use of remote capture technology—highlight the need for additional research into the BS deposits. Assessing the full significance of the variation (or lack thereof, in the case of the environmental data) evidenced in the pre-SB and SB fauna at Sibudu will require comparable data from other sources—particularly from the lithics and the geoarchaeological record. That being said, this study provides important context for future studies of behavioral variation spanning from the pre-SB to the post-HP MSA at Sibudu, and, as such, makes a valuable contribution to our broader understanding of a critical period in later human evolution. First and foremost, I would like to thank Lyn Wadley, who not only provided access to the faunal material, but has also supported my participation in research at Sibudu for over a decade. Ina Plug also deserves recognition; she introduced me to the Sibudu fauna and conducted a preliminary study of a sample of the SB and pre-SB fauna included in this paper. I would also like to thank Shaw Badenhorst and the staff in the Archaeozoology and Large Mammal section at the Ditsong National Museum of Natural History, who facilitated access to their comparative collection. Thanks are also due to Cassidy Phillips, who assisted in the processing and analysis of the faunal remains. Wendy Voorvelt created the original digital profile drawing on which Fig. 3 was based. Thank you also to the four anonymous reviewers; their comments and critiques helped to improve this manuscript. Data collection was supported by a research grant from the Wenner-Gren Foundation for Anthropological Research; Cassidy Phillips’ participation was funded by a grant from the Undergraduate Research and Scholarly Activity program at the University of Alaska Fairbanks. Lennox, S. J., & Wadley, L. (2019). A charcoal study from the Middle Stone Age, 77,000 to 65,000 years ago, at Sibudu, KwaZulu-Natal. Transactions of the Royal Society of South Africa. https://doi.org/10.1080/0035919X.2018.1552214. Lombard, M., & Högberg, A. (2018). The Still Bay points of Apollo 11 Rock Shelter, Namibia: an inter-regional perspective. Azania: Archaeological Research in Africa. https://doi.org/10.1080/0067270X.2018.1513240. Starkovich, B. M., Elefanti, P., Karkanas, P., & Panagopoulou, E. (2018). Site use and maintenance in the middle Palaeolithic at Lakonis I (Peloponnese, Greece). Journal of Paleolithic Archaeology. https://doi.org/10.1007/s41982-018-0006-x. Wojcieszak, M. A., & Wadley, L. (2018). Raman spectroscopy and scanning electron microscopy confirm ochre residues on 71,000-year-old bifacial tools from Sibudu, South Africa. Archaeometry, in press. https://doi.org/10.1111/arcm.12369. Yasuoka, H., Hirai, M., Kamgaing, T. O. W., Dzefack, Z. S. C. B., Kamdoum, E. C., & Bobo, K. S. (2015). Changes in the composition of hunting catches in southeastern Cameroon a promising approach for collaborative wildlife management between ecologists and local hunters. Ecology and Society, 20(4), 25. https://doi.org/10.5751/ES-08041-200425.